For the wedding I wanted to wear something that was comfortable but still dressy! I shared this dress on my Instagram stories as an option for Easter....well I decided to pick it up for myself while it was on sale for an additional 30% off. I did buy another dress that was a contender for the weekend but after placing a poll on Insta-stories and having you all vote, this dress won and I'm glad it did. This soft dusty blue has been popping up as a must have color this Spring. I love how feminine it looks with the all over lace and the length is perfect. It did happen to be a little chillier during the evening so I planned ahead and threw on this leather jacket. I'm so glad I brought it because it really came in handy when everyone headed out to the bars for the wedding after party when it was cold and rainy. I threw on some of my favorite sandals that I've shared before here and here. They're a great dupe for the Valentino Rockstar stud sandals. 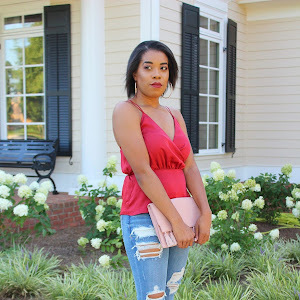 I kept my jewelry super simple with just a pair of studs then finished my look with my favorite suede bag!